Emergency room doctors are using them to order lab tests and medication. Plastic surgeons are using them to show patients what they might look like after surgery. And medical residents are using them as a quick reference to look up drug interactions and medical conditions. 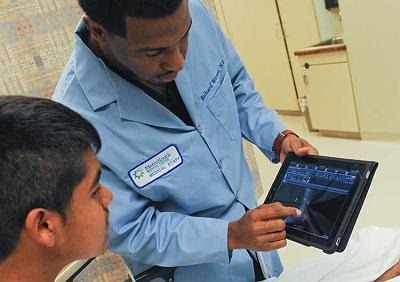 Since Apple’s iPad hit the market in April, doctors at Chicago area hospitals are increasingly using the hot-selling tablet as a clinical tool. That’s a slice from a recent report in the Chicago Sun-Times, highlighting the increasing popularity and adoption of the iPad in the Chicago health care sector. Among the most interesting things about the report is that it shows both the broad range of areas where the iPad is proving an effective tool, and also that the iPad seems to have nice dual-pronged adoption momentum – with both medical institutions and through individual health care staff, who are buying the device and finding that it is supported in their organizations. Not only does the iPad allow doctors to view electronic medical records, wherever they are, it also gives them a way to show patients their X-rays, EKGs and other lab tests on an easy-to-read screen. Plus, it’s lighter and has a longer battery life than many laptops, making it convenient for doctors to take on rounds. "The touch screen is intuitive and gives a hands-on experience for patients as they navigate through the pictures," Park said. The report also makes clear that no patient information is actually stored on the iPad – which is a key point as that would bring up immediate security concerns. Have any of you seen iPads in action at any of your local medical centers?